The richness of Turkish cuisine is known the world over, mainly in terms of its variety of dishes and ingredients. However there is also a great variety of traditional drinks. 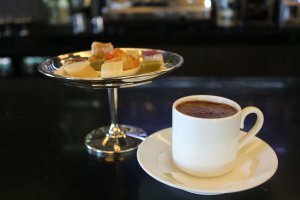 This article will examine the place of drinks within Turkish cuisine as a whole. Each has a different nutritive value of course, but here I will concentrate more on the types of drinks and their place in Turkish cultural life. The information presented is based both on personal observation and a study of the literature. The most common hot drinks in turkey are tea, coffee, linden tea, sage tea, cinnamon tea, milk and salep. Tea was introduced to Europe in the early 17th century. It was first raised in Turkey in Batum (present-day Georgia) in 1918. Tea is one of the most loved drinks in our country; so much so that even in the smallest of villages, tea will be available in the coffee house if nothing else. The coffeehouses and teahouses in our villages, small towns and cities are truly indebted to tea. Erzurum is the city that comes to most Turks’ minds as the place where the most tea is drunk. Why Erzurum? According to the locals, it has to do with the city’s climate and water. Tea drinking is one of the defining characteristics of Erzurum culture There is an entire cultural complex around tea, with tea-related traditions and behaviors. Most of the tea raised in the Black Sea region is consumed in Eastern Anatolia, and Erzurum is at the top of the list. The sugar used for tea in Erzurum is different as well. The hard blocks of sugar manufactured in local factories must be broken into piece with a special hammer called a “taka tuka,” in a special vessel. A piece of this sugar is dipped into the tea and then placed under the tongue as the tea is drunk, and melts by the time the tea is finished. Drinking tea in this way is known as kıtlama. There are different ways of serving tea in the coffeehouses. Especially tea served outside the coffeehouse is brought with the saucer inverted and placed over the full glass, to be set properly when it is served. Good waiters do not spill a drop of tea. The practice of drinking tea with a single piece of sugar can be explained economically; drinking tea sweet means higher sugar consumption. A man from Erzurum was invited to a wedding by a friend from elsewhere. They ate and drank a lot, but no tea was served. The man from Erzurum said “Ah, they didn’t lay any tea on us so we could digest...” The high consumption of tea may also have to do with the very cold winters in the region. Drinking lots of tea can also be habit-forming. The expression “let me drink a glass of tea and wake up” is heard more in Erzurum than anywhere else. When people from Erzurum can’t find tea, they make a sort of tea by boiling rose hips or blackberry root. In the villages of Erzurum, people drink tea after work to recover from their fatigue. Tea has created its own material culture as well. Samovars are part and parcel of traditional Turkish tea culture; other items include the typical Turkish double tea kettles, tea glasses and small spoons, and trays. In Europe and the U.S., tea is drunk from large cups. Here that is more a habit of the upper economic groups. When Turks living in America come to Turkey, one of the most appreciated gifts for their Turkish friends back home is a of traditional Turkish tea glasses, because such glasses are very difficult to find there. For them, those glasses bring out the flavor of the tea. Our government offices and other workplaces couldn’t run without tea, people drink it constantly throughout the day. Whether working or having a conversation, they don’t feel comfortable if there’s no tea. And as if that weren’t enough, they drink it when they come home as well. There is no formal tea/coffee break as there is in the West, because here tea is drunk constantly. A workplace that forbade the drinking of tea during work hours would be unable to survive in our country. The quality of the tea is unimportant; good or bad, everyone drinks it. As tea is the only thing there to treat friends, people who don’t treat their friends to tea are considered stingy. The major tea producing countries in the world are India, China, Georgia, Turkey and Iran. 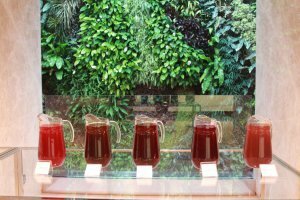 In 1904 Americans began to drink iced tea, but there is no such tradition in Turkey. One of our other hot drinks is linden tea, also known as lime, because of the fragrance of the flowers. It is mostly drunk at home, medicinally. It is diuretic, causes perspiration, has a calming effect and clears the chest. For this reason linden has recently begun to be offered at workplaces as well. Workers who for health reasons prefer not to drink black tea all day, choose linden tea instead. Just like linden, tea brewed from sage is drunk hot. It is especially popular in Western Anatolia where it can be found in coffeehouses and teahouses. 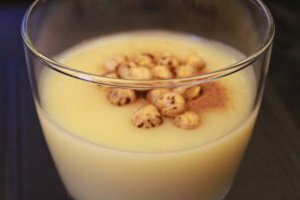 This is drunk as tea in various regions, where it is enjoyed for its flavor and color, and has begun to appear in coffeehouses and workplaces. Coffee was first raised in Arabia in the 15th century. It reached Turkey in the 16th century, and the brewing technique used here has become know the world over as “Turkish coffee.” However it is not raised in Turkey. The expression “come on, let’s have a coffee” does not mean simply to have the physical cup of coffee. One treats a friend to a cup of coffee in order to have a conversation, to share ones sorrows or to gossip. The expression “a fatigue coffee” means to relax. Another interesting expression is, Bir fincan acı kahvenin kırk yıllık hatırı vardır. This means, “One cup of bitter coffee is remembered for forty years.” This refers to the reinforcement of relationships and friendships over coffee. The practice by Turkish women of reading fortunes in coffee grounds is psychologically comforting, as it does away with worries about the future. When a matchmaker goes to a home, or a family goes to speak the family about a prospective marriage, it is traditional for the girl to serve coffee. The real reason behind this is for them to see the girl. Traditionally, it was unacceptable for children and young people to drink coffee together with adults; to do so was considered disrespectful. The real reason for this was to keep young people from becoming involved in the adults’ conversations. Of course there is also the issue of coffee being harmful to young people’s health. Coffee is served plain, slightly sweet, medium sweet or sweet. It is also fairly common to add milk to coffee. Folk medicine uses coffee in the treatment of various ailments. Though coffeehouses obviously are so called because of coffee, as coffee has become more expensive, they have become places where mainly tea is drunk; the main object being conversation of course. Only in recent years have people begun to converse less in coffeehouses; with the spread of the game “Okey” (similar to mah-jong), one can see customers hunched over their tables for hours without saying a word to anyone. Like tea, coffee also has its own material culture, including all manner of coffee cups, cezves (Turkish coffee pots), hand coffee grinders, mortar and pestles for coffee (dıbek) and trays.